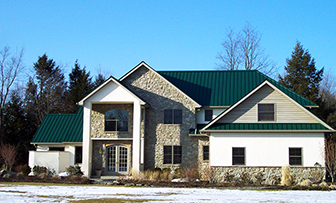 Blog / Which Metal Roof System Is Right For You? Once you choose to invest in a metal roof, selecting the right system for your home can be a difficult decision. What are the major differences between different metal panel products? How can different panel profiles change the aesthetics of the roof on your home? What performance attributes do each have? The three main metal panel roof systems are standing seam, concealed fastening and exposed fastening. Each provides a unique appearance and benefits. As one of the most durable and weather-tight roof systems available, standing seam roofs (SSR) offer a unique look with high seams that are raised above the metal panel to give it a sleek continuous design. The different types of standing seam metal roof systems are installed by either snapping the panels together or mechanically seaming with a machine, both of which eliminate penetration and allow for fewer places for leaks to occur. 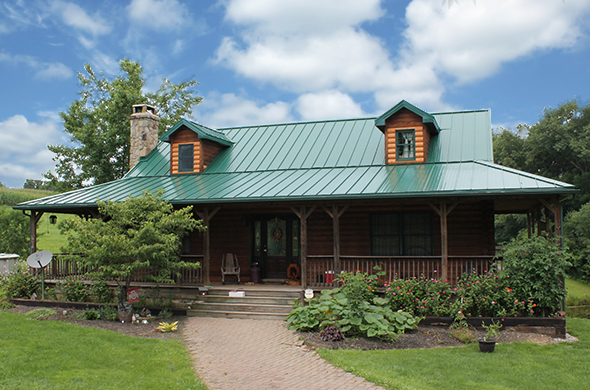 These beautiful profiles are common in the residential metal roofing market. Great for reducing the weathering that naturally occurs with roofs, this system presents the same protection and budget friendly cost of the exposed panel system. Because the concealed fasteners are hidden below the panel, they are not exposed to normal weather conditions, which allow the panels to last longer. The concealed fastening metal roof is typically a snap-on batten option that has strong lines to create a clean, aesthetic appearance, giving your home great curb appeal. This system, also known as through-fastened, is installed using screws of fasteners that penetrate the panels, leaving the screw heads exposed. As the traditional choice in the metal roofing industry, exposed fastening panels are most likely what you think of when you hear metal roofing or metal walls. This has led to them receiving a tainted reputation, often because of improper installation, which allows for leaks and premature rusting. But recently, exposed fasteners have made a comeback with watertight, neoprene washers which provide protection for the full life of the metal roof of your home. Given the many roofing options in today’s market, it is imperative that you understand your choices before making a decision. If you’re having trouble deciding or want to learn more about the individual systems, contact a manufacturer’s representative to provide assistance. Their knowledge of the product is sure to guide you in the right direction. I have been curious which form of roofing would work best for my new shed. I really appreciate the information this article provides on these forms. I especially like the idea of having a standing seam system. This would suit my needs as I need this roof to be extremely weather tight. Thanks for sharing!